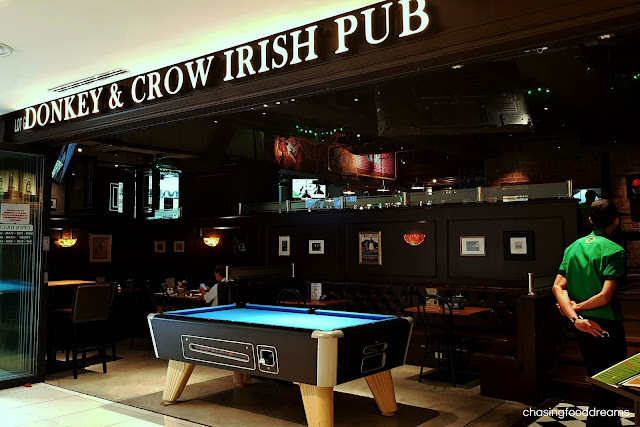 Scotch Eggs, Dublin Coddle, Grilled Pork Ribs, Crispy Pork Belly and Irish Stew… pub grub fans would agree on how tempting those dishes sounded. 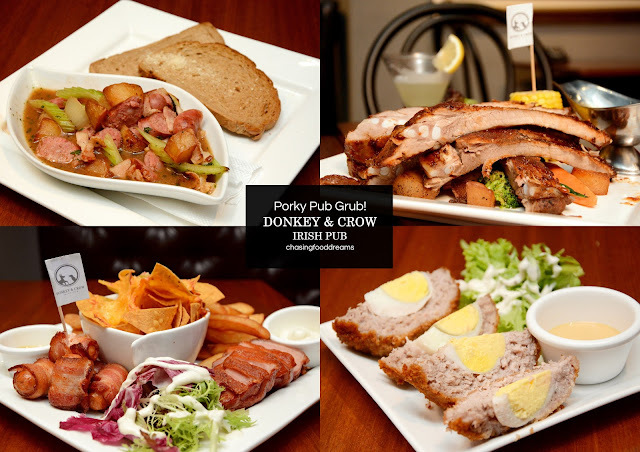 The folks at Donkey & Crow Irish Pub knows how to let their diners enjoy classic comfort food with a good beer or stout! Located at Bangsar Shopping Centre, this is the second outlet for Donkey & Crow. 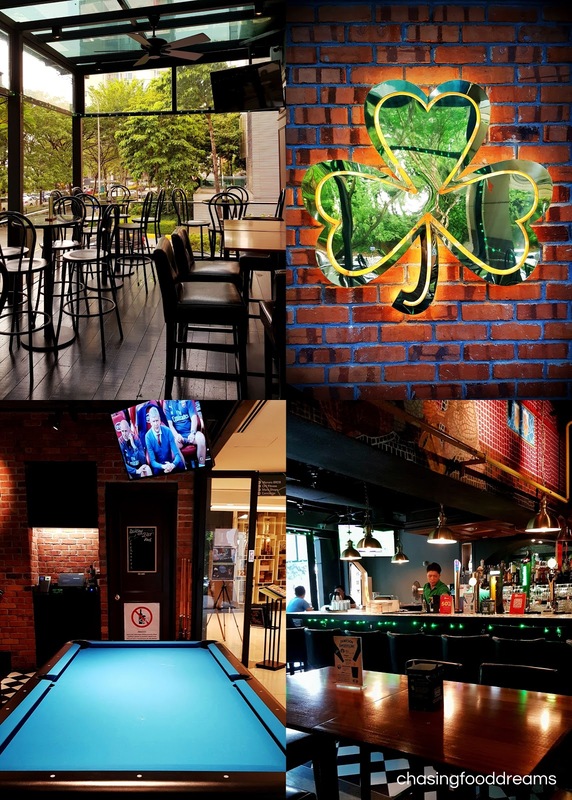 With their first outlet’s success at TREC KL, diners can now also enjoy the same pub experience at the BSC outlet. It’s all about having a good time at Donkey & Crow. Besides being a family-friendly restaurant serving classic Irish and British favorites, one can enjoy their long list of jolly pints of beer while catching up with some live sport actions. The pub offers alfresco seating as well as indoor seating. 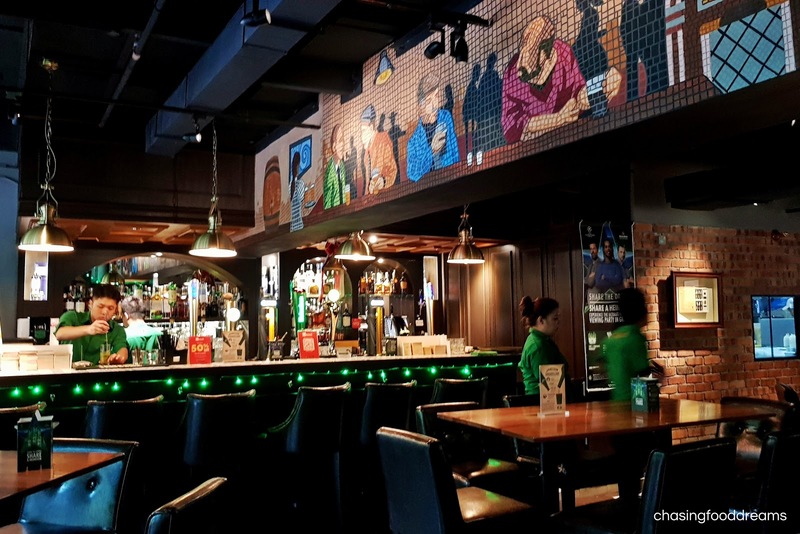 Expect lots of woodwork, a long bar, a mosaic mural, brickworks and Irish green fairy lights plus lots of friendly smiles from the service team at Donkey & Crow. Pool table for some fun! With our cocktails, we had to order a classic British pub favorite, Scotch Egg (RM23). Minced meat stuffed with egg and fried to a golden ball, ours was a generous one too. Packed with seasoned sausage meat, the scotch egg is quite a filler on its own. The pale but flavour-packed Blue Cheese Mushroom (RM23) is delicious. The unctuous flavour of the blue cheese is an explosion of flavours, so much so, one cannot stop dipping the toast into that luscious thick sauce studded with chunky mushrooms. The Snacks Platter (RM68) offers a little of everything to go with drinks. A sharing platter obviously, there’s golden Onion Rings, Pigs in the Blanket, Smoked Duck Breast, Nacho Bacon and Chips with side salad and sauces. Snacks like these are sure crowd pleasers, especially that yummy bacon wrapped sausage and delectable smoked duck breast slices. A platter that is perfect for snacking with beer or cocktails! Another signature dish at Donkey & Crow is the Grilled Pork Ribs with Whiskey Sauce (RM49). Half rack of pork ribs marinated with spices ad slow baked till tender. Not falling-off-the-bone kind of rib but this one has a solid meaty bite of the meat. Pour on the whiskey sauce for added flavours though we personally thought the whiskey sauce could do with more oomph of the whiskey… nevertheless, the pork ribs are well-seasoned and meaty. You may be interested in delivering an excellent service to your comfort food recipes If you sell baked goods, bakery boxes are the perfect way to present your products.